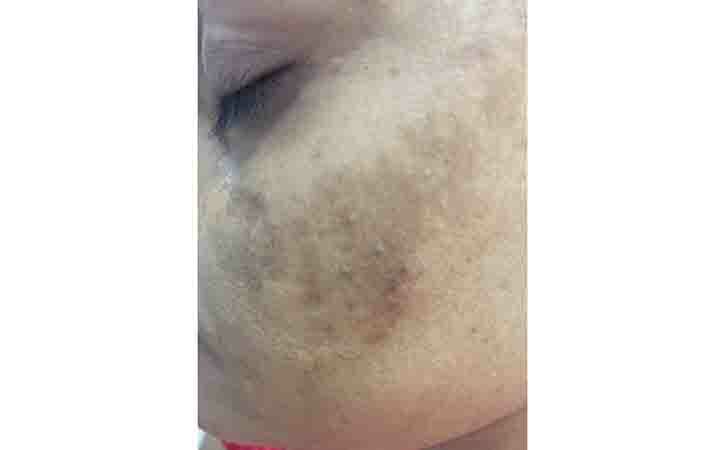 Melasma is a very common skin problem with patchy brown, tan, or blue-gray facial skin discoloration, usually seen in women in the reproductive years. It’s also called chloasma, or the mask of pregnancy. It typically appears on the upper cheeks, upper lip, forehead, and chin of women 20-50 years of age. It is uncommon in males. Melasma is characterized by three location patterns (central face, cheekbone, and jawline). It is thought to be primarily related to external sun exposure, external hormones like birth control pills, and internal hormonal changes as seen in pregnancy. Most people with melasma have a history of daily or intermittent sun exposure, although heat is also suspected to be an underlying factor. Melasma is most common among pregnant women, especially those of Latin and Asian descents. People with olive or darker skin, like Hispanic, Asian, and Middle Eastern individuals, have higher incidences of melasma. Four types of pigmentation patterns are analyzed in melasma: epidermal, dermal, mixed, and an unnamed type found in dark-complexioned individuals. The epidermal type is identified by the presence of excess melanin in the superficial layers of skin. Dermal melasma is distinguished by the presence of melanophages (cells that ingest melanin) throughout the dermis. The mixed type includes both the epidermal and dermal type. In the fourth type, excess melanocytes are present in the skin of dark-skinned individuals. Melasma causes patches of discoloration. The patches are darker than usual skin color. It typically occurs on the face and is symmetrical, with matching marks on both sides of the face. Other areas of body that are often exposed to sun can also develop melasma. It can also occur on the neck and forearms. The skin discoloration doesn’t do any physical harm, but may feel self-conscious about the way it looks. The cause of melasma remains unknown. 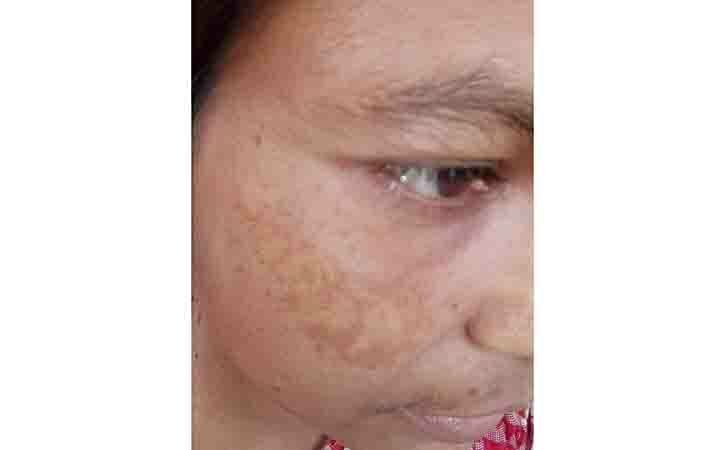 The dark patches in melasma could be triggered by several factors, including pregnancy, birth control pills, hormone replacement therapy (HRT and progesterone), family history of melasma, race, and anti-seizure medications. Sunlight is the most important factor in the production of melasma, especially in individuals with a genetic predisposition to this condition. Individuals typically develop melasma in the summer months, when the sun is most intense. In the winter, the pigmentation in melasma tends regress. When melasma occurs during pregnancy, it is also called chloasma, or the mask of pregnancy. Pregnant women experience increased estrogen, progesterone, and melanocyte-stimulating hormone (MSH) levels during the second and third trimesters of pregnancy. Melanocytes are the cells in the skin that deposit pigment. Pregnancy-related melasma is caused by the presence of increased levels of progesterone and not due to estrogen and MSH. Postmenopausal women who receive progesterone hormone replacement therapy are more likely to develop melasma. Postmenopausal women receiving estrogen alone seem less likely to develop melasma. Products or treatments that irritate the skin may cause an increase in melanin production and accelerate melasma symptoms. The most common candidate for a chemical peel is a person with sun-damaged skin, uneven pigmentation, and/or actinic keratoses. Many types and strengths of chemical peels are available for different skin types. The type of peel should be tailored for each individual and selected by the physician. In treating melasma, 30%-70% glycolic acid peels are very common. Various combinations, including a mix of 10% glycolic acid and 2% HQ, can be used to treat melasma. There is no guarantee that melasma will be improved with these procedures. Lasers may be used in melasma, but they generally produce only temporary results. Laser therapy is not the primary choice to treat melasma as it reveal little to no improvement in the hyperpigmentation for patients. Lasers may actually worsen some types of melasma and should be used with caution. Multiple laser treatments may be necessary to see results, as treatments are most effective when they are repeated. To ensure that treatment doesn’t fail, people must minimize sun exposure. People who treat their melasma report a better quality of life because they feel better about themselves. Pregnant women or mothers breastfeeding may need to wait to treat melasma. Many melasma creams need to be discontinued in pregnancy. These people may consider cosmetics to temporarily conceal the skin discoloration. If notice symptoms of melasma, see a dermatologist. In case of high risk group, like: positive family history with pregnancy, need to consult with a doctor. Before start medication, consult with a doctor.